It was seed catalog heaven this weekend as I poured over all my seed catalogs to send for the year’s seeds. Took my mind right off the sawdust and jet engine construction noises in the next room! 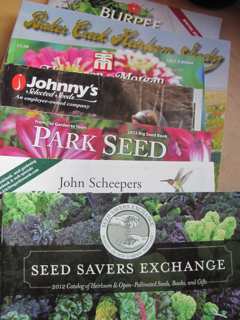 My favorite catalog remains the Seed Savers Exchange- All their seed is saved by their members, and they fight the good fight against GMOs. I love that they share the stories of how seeds get saved. One tomato I am getting from Seed Savers this year is a yellow tomato called Emmy. It’s rescue as a seed involved a woman named Emmy. To save her life, she had to flee from Transylvania at the end of WW2. She actually grabbed a tomato from her garden as she ran from her home, hoping to preserve this tomato as well as her own skin. I have to respect this kind of serious gardener. I can’t imagine thinking straight enough to save a tomato from extinction in this kind of situation! It has surprised me how many dramatic seed saving stories I’ve heard over the years. During the break-up of the Soviet Union, Soviet citizens escaped the country via the Caucasus mountains in order to save seeds. Others risked serious consequences when they handed US tourists parcels of seed through tour bus windows, entrusting literal strangers to save precious plant varieties. The seed situation became a crisis in the faltering Soviet Union when seed banks were subject to power outages and government seed inventories were no longer kept under proper conditions for preservation. Getting these seeds into the hands of actual gardeners who would grow them was both heroic and visionary. I can see how important it is for us to have actual gardeners growing the seeds of earth, not just trusting to seed banks to keep seeds safe. May more and more people find themselves preserving the diversity of earth in this way (hopefully without having to run over any mountain ranges to do the job). It may shock people that I buy seeds from Parks and Burpees as well as Heirloom organizations, but the resources they can bring to seed hybridization means they sometimes have real treasures. 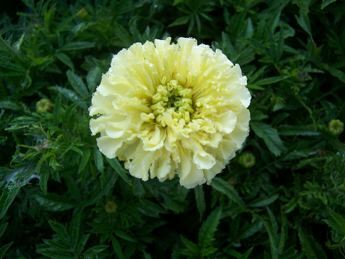 Our beloved Mehera White Marigold seeds took Burpee 56 years work. I will always be grateful to the member of the Burpee family who was as crazy about this Flower as I am! I watch with delight the rise of Baker Creek Heirloom Seeds. The catalog is passionate and flaky and chock full of heirloom seeds, and somehow the man behind the catalog is keeping it all together even as he buys up failing seed houses, runs a replica Ozark village in Missouri and takes photos of his four year Sasha eating every vegetable under the sun. If he can buy the Petaluma Savings Bank in Petaluma, CA and transform it into a thriving seed bank- Well props to him! And props to all who are buying and growing and saving heirloom seeds and saving our heritage just like Emmy with her yellow tomato! Since moving the bathroom, the only calm place in the building IS the new bathroom. Its like cascading dominoes around here- One little project catapulted us into about twenty other necessary fixes…… PLUS we decided as long as we were doing construction we “might as well rebuild all our bookshelves.” I must have breathed a bit too much plaster dust the night I had THAT thought. What lunacy it was to compound the situation with this add on! Right now all our books are packed up in boxes and stacked in various bedrooms upstairs which means everyone trips over boxes on their way to bed and of course none of us can find any book we want. Downstairs, sawdust is everywhere, and standards are getting lower and lower by the minute as dust covers everything in the house. A Green Hope friend emailed me today and asked me to write a blog about watering plants. I did water all the plants in the greenhouse today, but it was bedlam out there as they too are covered in sawdust. I hosed some of them down and then felt that only meant they’d gather dust better. I am sure they too are feeling that water is the least of their problems right now- If they could, they would probably FIRE ME! But to briefly and inadequately cover the topic of watering, I think watering plants is symbolic of self care. Watering takes time and it matters a lot – much like self care. A beloved gardener friend whom I learned a particular lot from lavished water on all seedlings and took watering extremely seriously. She also took really good care of herself. I try to follow her example, but sometimes I get bogged down and both me and my plants get a bit wilted. Today was like that. The greenhouse plants looked bedraggled and so did I. At first, during this spurt of construction projects, I thought I was sailing along just great. I congratulated myself on being soooooooooo flexible. I did Christmas without any of my cookbooks and “loved it!” I had a livingroom/kitchen in which there was really no place to sit down except the floor and it was CHARMING!. La di di! I was CHILL. I (sort of) managed this light hearted attitude for a number of weeks, but now I feel a bit growly! Ten weeks in and I really don’t care if I have floors or hearths or a working wood stove, I just want it to be over- It’s a little bit like childbirth really. At some point you lose all track of a baby coming or there being any point to the pain and I AM AT THAT POINT. Jim tells me by next Friday we will turn the corner (I think this means all floors will be in place). How exciting! I will be able to pull up a chair and look at the walls and ceiling that now need to be painted and also note that every thing in the whole house, including all the greenhouse plants, needs to be washed. PLUS all those new bookshelves will need three coats of varnish! Should be a wonderful moment! Its like cascading dominoes around- One little project catapulted us into about twenty other necessary fixes…… PLUS we decided as long as we were doing construction we “might as well rebuild all our bookshelves.” I must have breathed a bit too much plaster dust the night I had THAT thought. Ten weeks in and I really don’t care if I have floors or hearths or a working wood stove, I just want it to be over- Its a little bit like labor really. At some point you lose all track of a baby coming or there being any point to the pain and I AM AT THAT POINT. How exciting! I will be able to pull up a chair and look at the walls and ceiling that now need to be painted and also note that every thing in the whole house, including all the greenhouse plants, need to be washed. PLUS all those new bookshelves will need three coats of varnish! I posted these two photos on Facebook yesterday but also want to put them up here, because I want as much input as possible on this project. 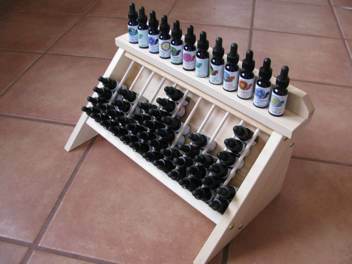 We have a carpenter friend, Jay Waldner, who is interested in making wooden Flower Essence racks for shops and practices. He is a marvelous craftsman and problem solver. Our inventory sits in beautiful wooden stands of his creation. When he built these floor to ceiling stands for us, he thought through the issues we confronted including how the Flower Essence bottles could slide smoothly as inventory was pulled. His stands manage our inventory in a way that is both functionally flawless as well as extremely elegant. That is really the hallmark of his work: issues of form and function are both addressed beautifully! This is Jay’s first prototype. It a two piece affair that will hold 6 bottles of 24 different Essences. The two pieces don’t have to be sold together, but together they would be perfect for the Animal Wellness Collection as they would hold the 22 remedies of this collection while also offering space for the frequent additional Essences, Golden Armor and the Arbor Garden. In this prototype, the dividers are made from pine although Jay says they could also be made from cherry. Jay thinks he would finish the pieces with a mix of tung oil and varnish. In their protoype stage, they are not varnished. The angle of the surface the bottles sit on is 20 degrees, but Jay could shift this easily so that the bottles slide more easily when the bottom bottle is removed. This second prototype uses dowels for dividers. It would probably be easier to clean. Jay said he would be happy to build a second unit to go behind this one, but I suggested we post these photos and get your input before he builds this. The angle of this prototype is much steeper, about 45 degrees. I can take more photos if people want them. I can also given you exact measurements of the units. We have received a lot of requests for this kind of rack over the years. Now that we have someone willing to provide them, we need more data from you before he goes into any kind of production. Is this the size unit you would like? Would you rather have racks that held fewer bottles of more Essences for example a rack that holds three bottles each of 36 or 48 Essences? Would you rather have much smaller units that could work as building blocks? How much would you be willing to pay for one of these? 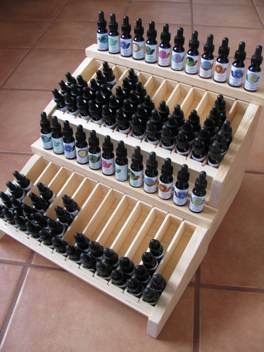 Would you rather not have the sample bottles set on top of the units? What are the concerns you would like us to address with these racks? Email your thoughts, suggestions, feedback, ideas to us at [email protected] or post your thoughts on our Facebook page! THANK YOU! On and off for the last few months, I have been working on the next edition of our Guide to Green Hope Farm Flower Essences. Earlier in the fall, a lot earlier actually, I re-organzied the Essence lists in the Guide to include all the new Essences made since the last edition was printed. This is, like, step one in a eight thousand step process. I don’t know exactly what I was planning to do next- I always take a meeting with the Angels and Elementals of each Flower to go over our definition to revise them, and these meetings take time. Perhaps I was planning on starting that part of the project- but before I did so, I decided to compile the sweet letters and lovely feedback you have sent us in the last few years into one document. As I have mentioned here before, my hope was to post this document on the website as well use many new quotes in the next Guide. It is still my hope. When Jim does a project, he always has a pretty good idea of how long something will take. I am notorious for saying, “Let’s slap up a new tool shed this weekend.” Jim is notorious for bursting my fantasies about what exactly can be “slapped up” during a weekend. This sums up the plot line of our life together. I suggest wildly ambitious projects to be done in ridiculously short amounts of time. He tells me it will actually take ten thousand hours, then we both roll up our sleeves and get started. Without Jim involved, I had no idea compiling this document would take so long. The nice thing is that it is fun to read all your letters again and revisit with you and your stories. The challenging thing is that the project is like that fairy story about the endlessly refilling pot of porridge. Every time I think I am on my last pile of saved stories, I find another one. While some piles grow, others diminish. Each week I go out to the barn where the last of the Guides are in storage and count boxes. How long until I absolutely have to finish this re-write and get it to the printers? I play games with myself about this. I don’t ask for any hard numbers from Thembi about how many boxes of Guides she actually brings into the office each week. I gloss over how many boxes are left, forgetting the number between when I count them in the barn and when I get back to my pile of unsorted stories. This week, as I worked through more piles, I could see Angels signaling me that it was time to wrap up this portion of the re-write project and get to the other stuff. I tried not to pay any attention! After all, there was still more of your mail to re-read!!!!! Their gestures grew more animated in the last few days. As I told myself,”Just a few more inches of this pile!” I could see them doing the “WRAP IT UP NOW.” signal. So many great stories and wonderful insights! Does it really have to be today that I put the rest of the mail back in a new folder for the Guide AFTER this one? Jim would say yes. And he is not alone. In fact, I hear an Angel right this moment telling me, YOU NEED TO DO THIS NOW! Just a few more stories? Please?